Diri Kole is Haiti’s national dish. It’s full of flavor that will tantalize your taste buds. 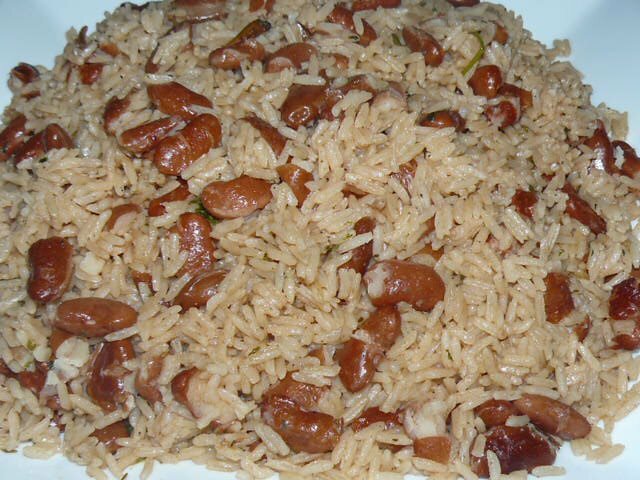 Although it’s mostly prepared with red beans, it can be cooked with a variety of beans: green peas, lima beans, black beans. Pour 4 cups of water into a pot. Add the red beans and garlic clove to a pot and let it boil over high heat. Add more water as the beans begin to surface to the top. Let it cook until the beans are softened. Drain the beans and reserve the liquid. In a separate pot, add 1/4 cup of oil over medium-high heat. Add the cooked beans and sautee for about 2-3 mins. Mix in the minced garlic, diced onions, chicken bouillon cube, whole cloves, seasoning salt, black pepper, and epis for another minute to bring out the flavor. Add in the fresh thyme and bay leaves. Pour in the reserved liquid (totaling 3 cups). Stir in the rice and scotch bonnet pepper. Reduce to low heat, cover and let it cook until all the liquid is absorbed for 25-30 mins. Do not peek in or lift the lid the entire time. Remove bay leaf and thyme. Serve hot. The speed of cooking is in the bean soaking process. Be sure to soak your beans overnight or for at least 4 hours. It will reduce your cooking time by half. My only question is: isn’t there some coconut milk involved? Anyway, i live far far from home and this recipe is just what the doctor ordered for my dinner party. Thank you!